I’ve been hearing about it for years, but had never seen it for myself. As unlikely as it sounds, the world’s largest boat show is actually in Dusseldorf Germany, 100s of kilometers from the sea, in the middle of winter! I visited the show this year and wore out a good amount of my shoe soles visiting each of the 17 halls of this massive exposition, which includes just about everything you can do in, on and under the sea. The Outremer folks were there, and although they didn’t bring any boats, they did have their cool, new, virtual reality theater running. With this you can walk around a model of a boat to see it from outside and inside, and you can also become a passenger on a 5X under sail. Definitely a cool experience! These Hybrid Stand Up Paddleboards that have a sail attachment to convert to a windsurf board were really nice. Not only are they inflatable, so easy to store on a cruising sailboat, but their ability to be used as a regular SUP and also a windsurfer, makes them a really versatile water toy when at anchor! The best Man Overboard device I have seen is this Jon Buoy from Ocean safety. Not only is it really easy to spot from a distance, but it’s actually a mini, 1, person liferaft that you can climb into while waiting to be rescued. To deploy, you throw the rail mounted canister overboard and the whole thing self inflates when it hits the water. Inside the Jon Buoy, there’s room for 1 person, and an attached PLB beacon. The system includes an integrated harness with a lifting strap to help lift the raft onto the rescue vessel. Lagoon was at the show with two of their new model boats, the 42 (in the photo) and the 450S. And while I don’t think their boats are that great, their ability to get them inside an expo hall in Dusseldorf is definitely cool! This little device will pull you along underwater at high speed and is very maneuverable, for the ultimate human-dolphin experience! A lot of sailors are using drones for filming, but there are also a lot of drone casualties due to unintended water landings! The folks at Splash-Drone are making a waterproof drone that can not only survive a water landing, but can also take off from the water surface! EWOL propellers is a company in Italy that is specializing in high thrust, low drag propellers for catamarans. They use an ingenious 180 degree rotation design, along with a very low drag sailing mode for their propellers. I’ve been researching these for a few months now, because our motoring speeds on Wildling are a bit weak. The boats that have switched to EWOL props have reported anywhere from 10% to 50% increase in speed. This photo shows the propeller in forward thrust position. Here’s the propeller in sailing position. The blades rotate straight, so there is very little drag compared to a standard folding propeller. Here’s the propeller in reverse thrust position. The blades rotate almost 180 degrees from the forward position. When you compare this to the first photo you can see that the blade profile is very close to the forward position but with a reversed angle of attack. This gives a high reverse thrust compared to a standard folding prop, that just spins backwards with the same blade angle as in forwards. When we ordered Wildling, I was disappointed to learn that Outremer was no longer offering flexible, bimini roof mounted solar panels because they have had too many reliability problems with the panels they were using in the past. The folks at SunWare in Germany have been making their flexible panels since 1987 and believe they have perfected the art of building an electrically efficient panel that can withstand the rigors of long term cruising and high use. They are the suppliers to Leopard Catamarans, among others and have experienced almost 0 failures of the panel systems. I’ll be looking to add a few hundred more Watts to Wildling before we cross the Atlantic next year. Here’s the state of the art in dive masks. The full-face design eliminates fogging because the regulator is built-in, and produces an airflow over the mask lens surface. It allows for underwater communications by connecting to an integrated 2-way radio system, and the visibility is supposedly better than a standard mask. I was curious about how to equalize pressure because you can’t squeeze your nose like a regular mask. The OceanReef guy explained that they use an adjustable nose pad system that allows you to press you nostrils closed by pushing on the top front surface of the mask when you need to equalize, but breathe normally through your nose the rest of the time. Very cool indeed! The final stopoff on my tour of the show, was the Montenegro tourism booths to find out about marina logistics in that country. Because foreign flagged vessels only have an 18month visa for cruising inside the EU, we have to find a non-EU location to exit in order to restart our visa clock. The traditional choices of north Africa are too unstable these days, and even Turkey is becoming a concern, so I though Montenegro might be worth a look. In addition to their existing marinas, there are several new marinas under construction that should be completed this summer, and there are also some yacht management companies that will help with booking logistics and taking care of your boat while you are away. We will need to exit at the end of this summer, so I’ll continue to research this and report back on what we decide to do. To bad we did´t bump into each other! Had 2 great days at the show during the weekend! Loved the Splash Drone as well! Stiff price but looks good. We are heading down to Tunisia in the end of April to get out of Eu together with Venturi II (another Outremer 45), and then directly back to LGM again for the Outremer Cup. Hey Knut, sorry I missed you, but I’ll see you at the OCup in May! Great stuff Doug, thank you for the information. Regarding the prop, assume that you currently have the 3 blade Volvo folding prop? What options are you currently looking at besides the EWOL? I currently have the Volvo 4 blade folding prop. I’ve looked at a few different props, and there are some that look OK, but the reason I became interested in EWOL is because they replaced the props on KATO, which is a Schionning G Force 1800 built up the road from me in Noosa, QLD. After the EWOL props were installed she’s getting 10 knots at 1800rpm and 14knots at full power. I get just over 6 knots at 1800 rpm on Wildling, which is slow. The 5X is heavier than the G Force, and we have the same 75 HP engines, so I won’t match Kato, but I’m hoping we get somewhere close. It’s an expensive experiment, but I might have to be the guinea pig on the EWOLs and report back with the results. The EWOL prop you featured looks a lot like the PYI MaxProp feathering prop that is most popular in the U.S. I have had one on three monohulls & found them to be robust, reliable and very effective………especially adding thrust in reverse. Their geared mechanism is simple but effective & I believe the pitch is adjustable. MaxProp also has its own zinc at the tip for extra cathodic protection. In this part of the world, PYI has very popular & ubiquitous products. If you are sending large files, please use my Thru dropbox. It looks like the EWOL props are very similar to the MaxProp, so I’m glad to hear you have had success with them! The EWOL is also pitch adjustable with an additional zinc tip. I love the Man Overboard Bouy. It would be great if Wildling had one before your next big trip. Yes, I agree! I’m going to order a couple of these and fit them before the sailing season begins this year in the Med! Great update thanks Doug. We have the same issue with having to be out of the EU this Summer. We are heading to Spain, Balearic islands, Sardinia, Italy and then possibly going to Albania (not in the EU) and then Greece to leave Akaroa 11 for the Winter. I also thought the subject of the prop was very interesting. Are you going to get some fitted before next session? I’m pretty sure I am going ahead with the prop change, but I want to talk to the guys that installed my engines when I am in La Grande Motte at the end of next week to get a final opinion. I’ll be in LGM around the weekend of Feb 6th, let me know if you would like me to check on the status of your repair list while I’m meeting with Stephane. Ive been chipping away at the Outremer Guys to finish the repair work. it wouldn’t hurt to mention it in passing thank you. Will definitely keep you posted on the props. I didn’t buy a SUP, but Robin has wanted to get one for a while now, so we have been narrowing down the choices. Definitely don’t want it too tippy, so we may need to try a few out. Quick question regarding the propellers: you mention that you only get ~ 6kn at 1800rpm, what kind of speed do you currently get at 2200rpm, and as max speed / max rpm? Sailing a totally different kind of boat (Hallberg Rassy 40 – Volvo d2-55 so same engine but without turbo), we’ve drastically improved the thrust / rpm ratio by switching to a flex o fold propeller.. But still (a bit of) a mystery to me why.. Thanks for the great feedback on the blog! I didn’t make detailed notes of the speeds at different RPM, but I’m pretty sure we were around 7 knots at 2200rpm and 8 knots max, which is not good at all. We’re going ahead with the EWOL replacement and will be doing tests before and after at a range of RPMs so we will know for sure what the benefit of EWOL props are. I’ll do a separate post on the prop project as soon as it’s done. Probably about 3 or 4 weeks from now. did you consider the BRUNTONS propellers ? Better speed, MPG,… than EWOL in comparative test I read in a french nautical monthly . I started doing comparison research, but none of the comparisons I found were of much use. I even found tests that showed the Volvo props are better than the EWOL, when I know that on a fast catamaran, that is not the case. My impression is that the performance has a lot to do with the boat and motor setup, making it difficult to determine if a prop that does well on a full keel monohull will also work well on a light multihull. In the end, I went with EWOL because the model of prop we are installing has been designed specifically for high speed catamarans, which was confirmed by the results they achieved on the Schionning G-Force 1800, which has the same size engines as our boat and is very similar in length, weight and speed to the 5X. It’s quite possible that the EWOL props offer no improvement, but the only way to know for sure is to give them a try and measure the results. Love the boat show photos you shared. Hey, just curious and if you don’t mind my asking – why don’t you care for the Lagoon catamarans so much? Glad you liked the photos! Lagoons are fine boats, but they are not designed for performance cruising, which is what we are looking for in a catamaran. They are heavier, slower and their motion at sea is not as comfortable. They are however, excellent at anchor since they have more room, which is why they have been so successful in the charter market. I wrote a more detailed comparison between Lagoon and Outremer in this post. Hey, Doug, I did a specs comparison, and you’re right … seems like the Outremer has more sail area, less draft, less weight. I compared the Lagoon 42 to the Outremer 45. Both new models for both companies. Looks like the Outremer is more streamlined, too. With the light weight and larger sail, do you ever worry about tipping over? You asked a very important question that anyone considering a high performance catamaran has to think about. In the more common high weight, low power catamarans like this, and this, the risk of a capsize due to being overpowered is essentially zero, since the rig would rip off the boat before it could turn the boat over. 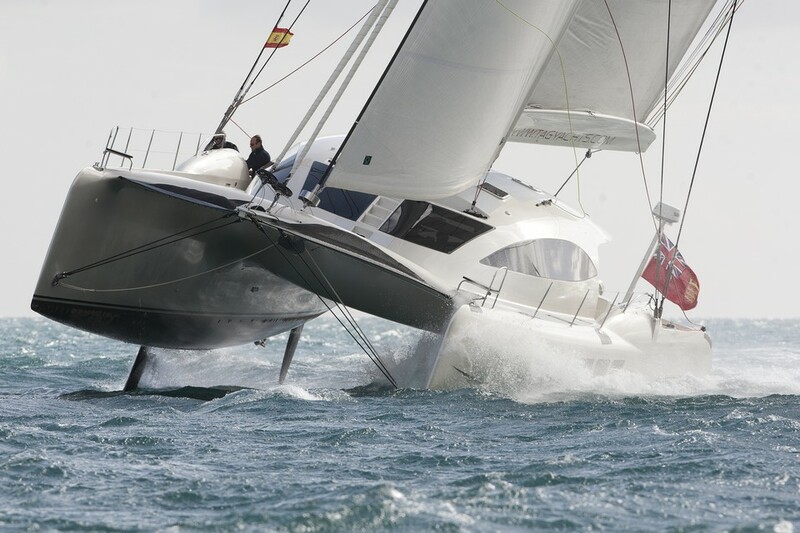 Multihulls do sometimes capsize though, which proves there are conditions that can overturn a modern multihull, but it’s usually the result of very high seas and wind and too much sail area, rather than strong winds alone. At the extreme end of the high performance cruising spectrum you have multihulls that are intended to fly a hull, like the Tag 60. When sailing a yacht like this, you need to be very careful not to get caught by unexpected conditions, or things can get scary very quickly. The 5X is somewhere in between the super high performance, and the traditional multis, in that the rig is strong enough to not fail, but it would also take very high winds, waves and a lot of sail area before it would risk flipping over. But it is possible to do it, so you have to pay attention to your sail configuration to make sure you don’t get overpowered. Some people install automatic sheet release systems that will (supposedly) release the sails in the case of imminent capsize. I prefer to sail conservatively, don’t push the boat too hard, and anticipate the conditions by reefing early and at night so that we never get caught by surprise.